Bob Vila Radio is a newly launched daily radio spot carried on more than 60 stations around the country (and growing). You can get your daily dose here, by listening—or reading—to Bob’s 60-second home improvement radio tip of the day. Today, it’s all about how Cleaning Saves. It may seem like a bit of a stretch to think of housework as a money-saving endeavor, but believe it or not, dirt can cost you money. If enough dust builds up on your refrigerator coils it can burn out the cooling fan and overheat the motor. Run a vent brush under the fridge and vacuum the coils with the brush attachment each season… your fridge will live a lot longer. Baseboard heating units radiate more efficiently when they’re vacuumed regularly. And your dryer’s important: cleaning out that vent every couple of months helps your clothes dry faster, and lowers the risk of a fire. Dirty glass on light fixtures and windows can actually block a lot of light…and the aerator on the end of your kitchen faucet could be holding sediment; remove and clean it every few months to keep the water flowing freely. 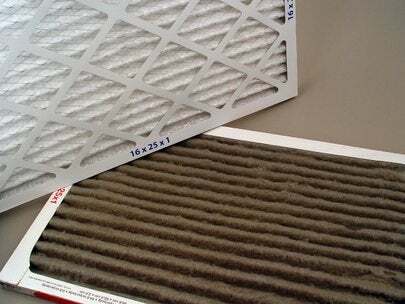 Change furnace filters on a schedule. If you have an electronic air filter, don’t wait until the cleaning light is blinking red; a clean system costs less to run.